Stone carvings of herons, dolphins, mythical beasts, and a ‘Green Man’, decorating the entrance archway to the Royal Academy of Arts near Piccadilly in London. They have done such a good job revamping the Academy … the stone work is wonderful, and interesting to see nature so well represented; love those mythical beasts. 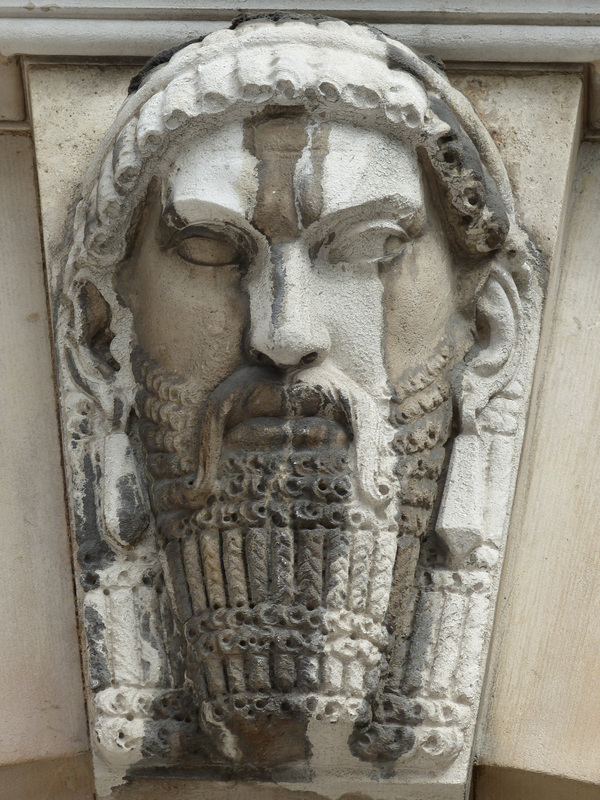 For some reason I am put in mind of the Assyrian reliefs I studied in college. Thank you, Claudia. 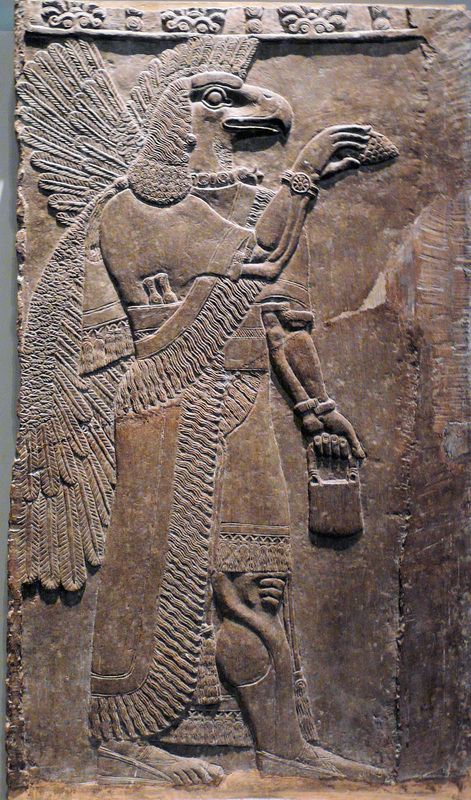 I have photos of the Assyrian reliefs. It is strange how these mythical beasts, Eagle-headed spirits, always carry a handbag and wear a wristwatch! Some things do not change.!!! I also like the sandals. 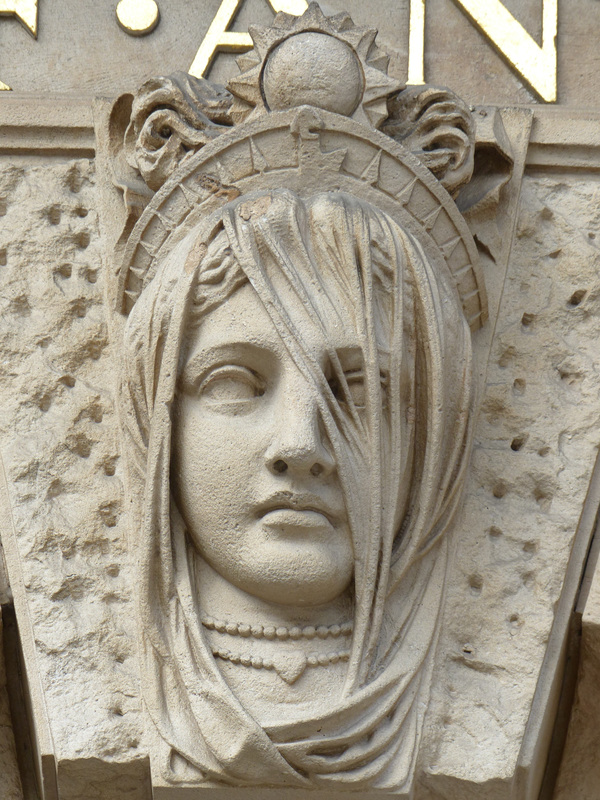 Did you also see the heads carved above the entrances of the scientific societies in the courtyard? Yes, I have posted them over on my other site. I am particularly intrigued by the face over the doorway to the Society of Antiquaries. Do you mean this one? It is called “The Veil of Time” but I do not know anything else about it. Do you know anything more that you would like to share? Lawks… *ashamed face* …now I see that there’s a stoney face for the Linnaean Soc, and I’d never even noticed. A resignation issue, probably. Never mind, probably your thoughts have always been on higher things even if your eyes were not – unless it was birds of course. That is most interesting, Philip, and the article is very well written. I’ll link it to the stone face piece over on Photosalmagundi if I may. Thanks Jessica, I find these stone heads fascinating and would like to know more. I did dig a bit but noone seemed to know.